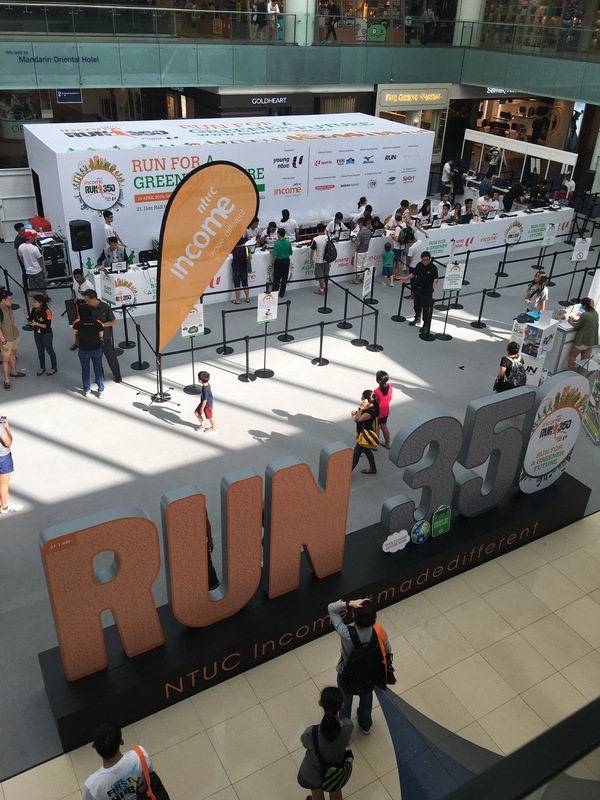 The NTUC Income RUN 350 2016 race pack collection was held at Marina Square, Central Atrium, Lv1 for 3 days from 25-27 Mar 2016, 11am-8pm. I went at 4+pm on the last day. There were signs placed near the venue to guide us to the collection location. 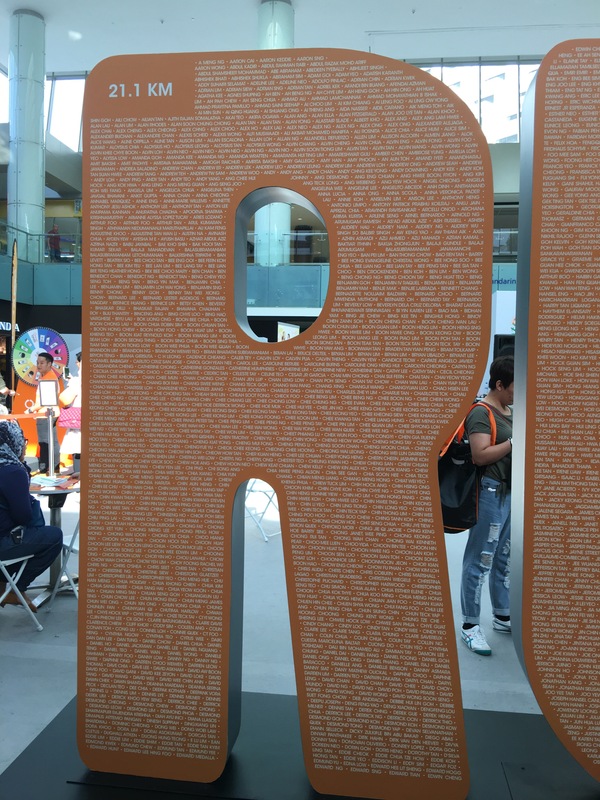 I was greeted by the large RUN 350 letters before I could see the collection booths. Like the 2015 Standard Chartered Marathon, the large letters were made up of all the runners names. I think that this is a nice touch and the message of how all of us runners make up the race is not lost on me. I was tempted to find my name, but decided to collect the race pack first. There were 15 race pack collection booths and luckily for me, there was no queue when I went. I was ushered to one of the booths, and a volunteer took my IC to verify my particulars. Another volunteer went to get my race tee. The first volunteer then checked that I got the race tee of the right size and that my racing bib was correct, placed them in a race pack and passed it to me. First impression of the race pack: light weight. Mizuno was at the race pack collection with their shoes at 30% off. A good deal! Soleus running watch was also there. I think that these are the two booths selling running related products. 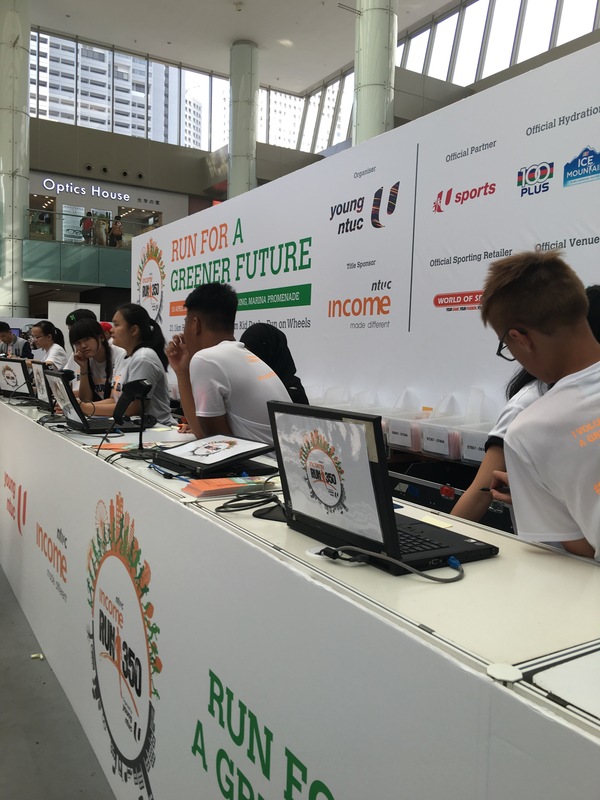 NTUC Income being the title sponsor? was there too. There was also a counter selling the shuttle bus tickets and I saw one counter for people to drop their old medals for recycling (must be part of their green initiative). I went to find my name after walking around and was excited that I found it! I also took a look at the programme guide, and saw that my 21.1KM race starts at 5.00am. Start early, end early, saying yes to no hot sun. The race pack is a round recyclable bag that looks like a duffle bag. Essentially this is a very bare bones race pack with only a pack of tissue to wipe your perspiration with. I expected more from such a larger scale race so I am somewhat disappointed by the race pack.